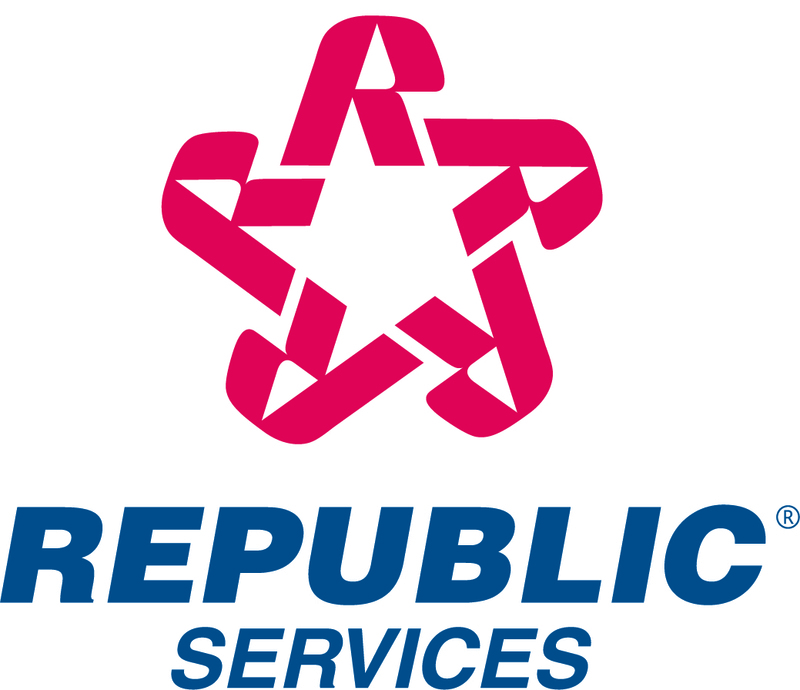 Republic Services, Inc. today reported that revenue for the three months ended June 30, 2008 increased 2.4 percent to $827.5 million compared to $808.4 million for the same period in 2007. The Company's internal growth during the period was 3.9 percent, with a 7.0 percent increase from price, partially offset by a 3.1 percent decrease in volume. Net income for the three months ended June 30, 2008 was $62.3 million, or $.34 per diluted share, compared to $87.2 million, or $0.45 per diluted share, last year. The Company's income before income taxes for the three months ended June 30, 2008 includes a $34.0 million pre-tax charge ($21.8 million, or approximately $.12 per diluted share, net of tax) related to environmental conditions at the Company's Countywide Recycling and Disposal Facility in Ohio. Net income for the three months ended June 30, 2007 includes a tax benefit of $5.0 million, or approximately $0.03 per diluted share, related to the effective closing of the Internal Revenue Service's audits of the Company's consolidated tax returns for fiscal years 2001 through 2004. Operating income for the three months ended June 30, 2008 was $119.6 million, or 14.5 percent of revenue, compared to $153.1 million, or 18.9 percent of revenue, for the same period last year. Excluding the $34.0 million charge to operating expenses for the Company's Countywide Recycling and Disposal Facility, operating income for the three months ended June 30, 2008 would have been $153.6 million, or 18.6 percent of revenue. Revenue for the six months ended June 30, 2008 increased 2.1 percent to $1,606.7 million from $1,574.0 million for the same period in 2007. Net income for the six months ended June 30, 2008 was $138.4 million, or $0.75 per diluted share, compared to $141.1 million, or $0.72 per diluted share, for the same period last year. The Company's income before income taxes for the six months ended June 30, 2008 includes a $34.0 million pre-tax charge ($21.8 million, or approximately $.12 per diluted share, net of tax) related to environmental conditions at the Company's Countywide Recycling and Disposal Facility. The Company's income before income taxes for the six months ended June 30, 2007 includes a $22.0 million pre-tax charge ($13.5 million, or approximately $.07 per diluted share, net of tax) related to environmental conditions at Countywide. Operating income for the six months ended June 30, 2008 was $261.8 million, or 16.3 percent of revenue, compared to $267.8 million, or 17.0 percent of revenue, for the same period last year. Excluding $34.0 million and $21.3 million of operating expenses included in the charges for the Company's Countywide Recycling and Disposal Facility during 2008 and 2007, respectively, operating income for the six months ended June 30, 2008 and 2007 would have been $295.8 million, or 18.4 percent of revenue, and $289.1 million, or 18.4 percent of revenue, respectively. Republic Services also announced today that it has updated its financial guidance for 2008. "The Company's performance was strong during the first half of 2008," said James E. O'Connor, Chairman and CEO of Republic Services. "Excluding the charge associated with the environmental remediation project in Ohio, we are on track to achieve the earnings guidance that we provided at the beginning of the year. I am especially pleased to see margins holding steady despite extensive pressure from diesel fuel costs." environmental remediation charge for Countywide. margins, excluding the environmental remediation charge. expected to decline by 3.0 percent. Republic also announced that its Board of Directors has approved a 12 percent increase in the Company's regular quarterly dividend from $0.17 per share to $0.19 per share. The quarterly dividend of $0.19 per share will be paid on October 15, 2008 to shareholders of record on October 1, 2008. "The combination of solid earnings and efficient use of capital has allowed us to increase our shareholder dividend," said James E. O'Connor. Republic reiterated the suspension of the Company's share repurchase program due to the planned merger with Allied Waste Industries, Inc.
(1) Derived from the December 31, 2007 consolidated balance sheet. The following information should be read in conjunction with the Company's audited Consolidated Financial Statements and notes thereto appearing in the Company's Form 10-K as of and for the year ended December 31, 2007. It should also be read in conjunction with the Company's Unaudited Condensed Consolidated Financial Statements and notes thereto appearing in the Company's Form 10-Q as of and for the three months ended March 31, 2008. The Company adopted the provisions of FASB Interpretation No. 48, "Accounting for Uncertainty in Income Taxes" ("the Interpretation") effective January 1, 2007, as required. During the first quarter of 2007, the Company recorded $4.2 million of additional income taxes related to the resolution of various income tax matters. During the second quarter of 2007, the Company recorded a $5.0 million reduction in income taxes related to the resolution of various income tax matters, including the effective closing of the Internal Revenue Service's audits of the Company's tax returns for fiscal years 2001 through 2004. The Company expects its effective tax rate for fiscal year 2008 to be approximately 38.5%. Proposed Merger with Allied. As previously reported, on June 22, 2008, the Company entered into an Agreement and Plan of Merger (the "Merger Agreement") with Allied Waste Industries, Inc. ("Allied"). The completion of the Merger is subject to certain terms and conditions, including, but not limited to, approval of the transaction by the shareholders of both Republic and Allied, regulatory approval from the Department of Justice, and receipt of credit ratings for the combined company classifying its senior unsecured debt as investment grade. The Merger Agreement also contains other terms and conditions that are customary for a merger of equals transaction. At the effective time of the Merger, each share of Allied common stock outstanding will be converted into .45 shares of Republic common stock. Republic expects to issue approximately 198 million shares of common stock to Allied shareholders in the transaction. Mr. James E. O'Connor, currently Chairman of the Board of Directors and Chief Executive Officer of Republic, and Mr. Tod Holmes, the Company's Chief Financial Officer, will continue in their present positions with the combined company. The transaction is expected to close in the fourth quarter of 2008. As of June 30, 2008, the Company had capitalized $4.9 million of costs to other assets that are directly related to the transaction. Countywide Landfill Remediation. During the first quarter of 2007, the Company recorded a pre-tax charge of $22.0 million ($13.5 million, or $.07 per diluted share, net of tax), related to estimated costs the Company believed would be required to comply with Final Findings and Orders ("F&Os") issued by the Ohio Environmental Protection Agency ("OEPA") in response to environmental conditions at the Company's Countywide Recycling and Disposal Facility ("Countywide") in East Sparta, Ohio. The Company has complied with and will continue to comply with the F&Os. However, even though indications existed that the reaction had begun to subside, the Company nevertheless agreed with the OEPA to take certain additional remedial actions at Countywide. Consequently, during the three months ended September 30, 2007, the Company recorded an additional pre-tax charge of $23.3 million ($14.4 million, or $.08 per diluted share, net of tax). During the second quarter of 2008, the Company received additional orders from the OEPA. The Company also entered into an Agreed Order on Consent ("AOC") with the United States Environmental Protection Agency ("U.S. EPA"). As a result of the additional orders received from the OEPA and the orders received from the U.S. EPA, the Company recorded an additional pre-tax charge of $34.0 million ($21.8 million, or $.12 per diluted share, net of tax) during the three months ended June 30, 2008. The remediation liability remaining as of June 30, 2008 is $46.8 million, of which approximately $14.0 million is expected to be paid out during the remainder of 2008. The majority of the remaining costs are expected to be paid during 2009 through 2011. While the Company is vigorously pursuing financial contributions from third parties for its costs to comply with the F&Os and the additional remedial actions, the Company has not recorded any receivables for potential recoveries. Capital expenditures include $.7 million and $1.0 million of capitalized interest for the three and six months ended June 30, 2008, and $.7 million and $1.3 million of capitalized interest for the three and six months ended June 30, 2007. As of June 30, 2008, accounts receivable were $320.1 million, net of allowance for doubtful accounts of $14.4 million, resulting in days sales outstanding of approximately 34.7 (or 20.8 net of deferred revenue). During the three months ended June 30, 2008, the Company paid $40.6 million to repurchase 1.4 million shares of its common stock. During the six months ended June 30, 2008, the Company repurchased a total of 4.6 million shares of its common stock for $138.4 million. As of June 30, 2008, the Company was authorized to repurchase up to an additional $248.0 million of its common stock under its existing stock repurchase program. During the second quarter of 2008, the Company suspended its share repurchase program as a result of its planned merger with Allied. In April 2008, the Company paid a cash dividend of $31.1 million to shareholders of record as of April 1, 2008. As of June 30, 2008, the Company recorded a dividend payable of $30.9 million to shareholders of record at the close of business on July 1, 2008, which has been paid. In July 2008, the Company's Board of Directors approved a 12% increase in the Company's quarterly dividend to $.19 per share. The Board also declared a regular quarterly dividend of $.19 per share payable to shareholders of record as of October 1, 2008.